Killer Targets and Doktor A deliver D*C 2012 exclusive! 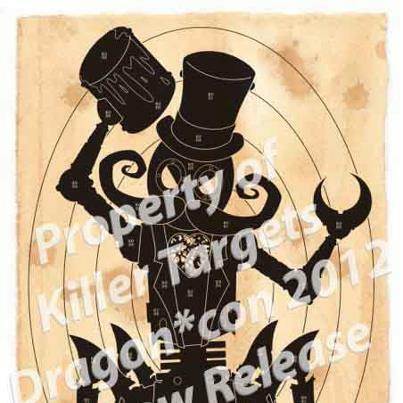 Dragon*Con favorite Doktor A will be represented this year with a special limited edition print release from the fine folks at Killer Targets. Although Dok will not be in attendance, this is an excellent opportunity to secure a rare show exclusive featuring his amazing design. Check back soon for full details and release times. A limited number of the exclusive Decommissioned Stephan LePodd art toys from the good Doktor and MINDstyle will also be available, in case you missed your chance to grab one the first time around. Killer Targets can be found all weekend in Comics and Pop Artists alley at booth #BT12. Strictly limited to 50 prints, with 40 available at Dragon*Con 2012. Signed and numbered by Doktor A. Print will be made available for sale exclusively at the Killer Targets booth in Grand Hall East of the Hyatt Regency on Saturday and Sunday, at 2PM. Priced at $25 each, you won’t want to miss a chance to add one of these beautiful 11×17 fine art prints to your collection!